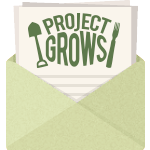 Project GROWS partners with schools, after-school programs, and community organizations throughout Staunton, Waynesboro, and Augusta County to bring hands-on, food-based education to youth and families year-round. Research shows that exposure to produce and garden-based education can increase willingness to try new vegetables and preferences towards vegetables, which are some of the strongest predictors of a healthy diet. Outreach programs include: farmer’s markets, farm to school events, community events, cooking classes, school garden projects, and more.